What does ball trap mean? What do the letters BTS signify on a candidate's CV? Where is Le Bourget ? Look no further, here are the answers to these questions, and to many others concerning French words or names beginning with B.
Bac Pro, professional Baccalaureate, a semi-vocational school-leavers' certificate. Baccalauréat: The classic school leaving certificate, taken by pupils reaching the end of secondary education. The traditional baccalauréat is caélled the Baccalauréat Général; a more recent innovation is the Baccalauréat professionnel (see above). The general baccalauréat is divided into three "series"; letters, science, and economic and social studies. for more detail see education in France. Badinter, Robert : (b. 1928). French lawyer and human rights activist. Badinter was appointed Minister of Justice in the first Mitterrand administration, in 1981. He is best remembered in this context as the man who successfully led the campaign for the abolition of capital punishment in France; abolition of the death penalty was one of the first major achievements of the Mitterrand presidency. From 1986 to 1995, Badinter was president of the Conseil Constitutionnel, the highest court in the land. BAFA : The brevet d’aptitude aux fonctions d’animateur is a diploma generally required for anyone wishing to work as a sports or outdoor pursuits assistant or instructor (an "animateur") in a holiday camp for young people in France. It is a qualification designed for non-professional and occasional employment, such as holiday jobs for students. Though it is possible to find this type of holiday job offers that do not require this diploma, it is not easy. BAFA courses are run throughout France, and consist of a week's theory, two week's paractical, and a week's specialisation. 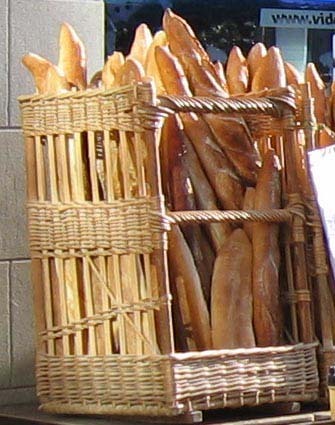 Baguette: The classic French bread stick, normally weighing 250 grammes. With a hard crusty outside, and a soft centre, a baguette should be eaten within at most 24 hours of baking. Ball Trap Many visitors to France have been perplexed, if not alarmed, by these words, often seen on small hoardings in villages and rural France. Ball trap is actually a popular rural French sport, and simply translates into English as clay pigeon shooting. Balladur, Edouard (born 1929) : Conservative politician, and Prime Minister of France from 1993 to 1995. Minister of the Economy in the first "Cohabitation" government of Jacques Chirac during the first Mitterrand presidency, he was appointed Prime Minister by Mitterrand at the start of his second term in office. While Chirac incarnated the traditional Gaullist wing of the conservative RPR party, Balladur was seen as more modern, more libéral and more European in his outlook - but also rather aloof and patrician. In 1995, he ran against Chirac for the presidency, and was at one time tipped as favourite, but lost out in the first round. Divisions in the RPR between the Chiraquiens and the Balladurians lasted for several years after this, notably with the sidelining by Chirac of an up-and-coming young minister, Nicolas Sarkozy. Banques: Banks, see under individual entries. Crédit Lyonnais, Société Générale, Banque Populaire, BNP, etc. Banque de France: the French central bank, founded in 1800 by Napoleon. Nationalised in 1945, the Banque de France has operated independently from government intervention since 1994. However, its vital role in the management of the French economy was largely diminished in 2002, with the disappearance of France's old national currency, the Franc, and its replacement by the Euro. Banque Populaire : A federation of regional cooperative banks, which is among the largest banks in France. The Banque Populaire group also includes a number of regional banks in France, and is joint owner of the Natixis investment bank. Taken together, banks in the Banque Populaire group have nearly 8 million customers. Barbie, Klaus : (1913 - 1991) Known during the Second World War as the "Butcher of Lyons", Klaus Barbie was a notorious SS officer. As head of the Gestapo in Lyons, he oversaw the torture, death and deportation of Jews and French Resistance fighters betwen 1942 and 1944. Most notably, he was responsible for the torture and possible murder of Resistance leader Jean Moulin, and for the deportation to Auschwitz of 44 children from an orphanage at Izieu, a small town to the east of Lyon. After the war, he fled to Latin America, eventually ending up in Bolivia. In 1983 he was finally exradited to France, where he was put on trial in Lyon for crimes against humanity. Though he pleaded innocent, Barbie was found guilty, and sentenced to life imprisonment. He died in jail in 1991. Bardot, Brigitte The most famous French film actress of the 1950s and 1960s. Bardot was the symbol of the sexual emancipation of the period, and the most famous French woman of her generation. Known as BB (pronounced Bébé - meaning Baby), she was for many years the incarnation of the seductive French woman, and appeared in some fifty films, before retiring from the screen in 1973. Since then, she has become a militant animal-rights activist, founding the Brigitte Bardot Foundation in 1986. More recently, she has lost a certain amount of popular respect, on acount of her sympathy for a number of extreme right-wing causes. Nevertheless, in Febrary 2008, in an international survey, she was voted the second most beautiful woman in the world, after Catherine Zeta Jones. Barre, Raymond, 1924-2007 Prime Minister of France under president Valéry Giscard d'Estaing, from 1976 to 1981. Barre, who began his career as a professor of economics in Paris, worked in the finance ministry and in the European Commission in Brussels, before being chosen as Prime Minister by Giscard. At the time, as an economist rather than a politician, he was relatively unknown to the French public. He is the only person in recent French history to have reached a top government position without first rising through the ranks of a political party. Bastille Day 14th July. Le quatorze Juillet The French national holiday, celebrating the fall of the Bastille during the French Revolution, on 14th July 1789. This date was not officially declared France's national day until almost a century later, in 1880. The day is traditionally celebrated by a flamboyant military parade along the Champs Elysées, in Paris, in the presence of the President of the Republic. Bataclan - A concert hall in the 11th arrondissement of Paris. Built in the Chinese style in 1864, it started life as a café concert. Since the 1970's it has been used as a concert venue, particularly for rock concerts. On 13th November 2015 it was the scene of France's worst terrorist atrocity, when the hall was stormed by a small commando of Islamist militants, during a concert by the American rock group Eagles of Death Metal. Ninety people were killed as the terrorists sprayed the hall and surrounding area with gunfire. A year later the Bataclan reopened with a concert by Sting. Bercy (Ministère des finances). "Bercy" is the name given to the new French finance ministry building, situated on Quai de Bercy, on the right bank of the Seine, just beside the Gare de Lyon. The name is also used to refer to the ministry itself, or to its policies. The massive building, sometimes used to symbolize the size and weight of the French civil service itself, is architecturally impressive, straddling a main road and protruding over the waters of the Seine at its southern end. Bercy, palais omnisports The principal indoor sports arena in Paris, located beside the river Seine, just a short distance from the Gare de Lyon station. the arena is also used as a venue for major rock concerts. Bérégovoy, Pierre (1925 - 1993) : Socialist Prime Minister of France 1992-1993, at the end of the second Mitterrand presidency. Former metal worker and trade unionist, who bacame a close advisor to Pierre Mendès Fance, and later private secretary to François Mitterrand. In 1992, after the disastrous months of the Cresson government, Beregovoy was appointed Prime Minister, in the hope that he could revive the flagging fortunes of the Socialist Party. he failed, and in 1993, the conservatives were returned to power. Just over a month later, he was found dead with two gunshot wounds to the head. A verdict of suicide was returned. Besancenot, Olivier. b 1974. Chief spokesman and virtual leader of the NPA, the Nouveau Parti Anticapitaliste, a left-wing anti-capitalist party founded in early 2009. Prior to the founding of the NPA, Besancenot had been leader of the LCR Ligue Communiste Revolutionnaire party. Very telegenic and a good speaker, Besançenot is a popular guest on radio and TV talk shows. He ran in the presidential elections in both 2002 and 2007, and each time achieved over 4% of the vote. Eschewing labels, he simply describes himself as a "revolutionary", and can be described as a classic example of the French intellectual left. Born into a middle-class family, he achieved a postgraduate degree in modern history from the University of Paris, but works as a postman. Besançon, Festival de musique. One of France's well establised classical music festivals, that takes place each year in September, in Besançon, a historic city in eastern France, not far from Switzerland. The festival is renowned for its bi-annual young conductors competition. Bettencourt, Liliane. (1922 - 2017) According to Forbes magazine Liliane Bettencourt was the richest woman in Europe. Only daughter of Eugène Schueller, founder of the L'Oreal cosmetics empire, the world's largest cosmetics company, she owned some 30% of the company's shares. In 2010, at the age of 87, she was at the centre of a politico-financial media frenzy, involving allegations of tax evasion and the illicit funding of President Sarkozy's UMP political party. Bibliothèque Nationale. The French national library, known to academics as the BN, was historically sited in the First arrondissement of Paris. As a deposit library, the BN receives a copy of every book and periodical published in France. It also contains the most important French collection of manuscripts and old printed books from before the Revolution. Previously located in the Rue Richelieu, in the 1st arrondissement of central Paris, the library moved in 1996 to custom-designed new buildings beside the Seine in the 13th arrondissement known as the Bibliothèque François Mitterrand. The last of France's "grands projects" of the 20th century, the building attracted criticism for environmentally-poor design - in particular for the idea of storing books in eighteen-story glass-clad skyscraper buildings. Bio : Short form of biologique, meaning organic. See AB - Agriculture biologique. Bise,1. faire la b. : Kissing people on both cheeks (not on the lips) as a form of welcome, or farewell, is a normal part of life in France. It is a well codified social practice, but the format varies from region to region. Generally speaking, in northern France people kiss twice, once on each cheek, in Mediterranean France three times, and in the Paris area four times. It is customary to start with the right cheek. Bise, la 2. : Cold north-easterly wind that blows across central eastern France, particularly during periods of anticylclonic high pressure in winter time. La bise frequently veers south between the Alps and the Massif Central, and is one of the sources of the Mistral wind that blows down the Rhone corridor. Bison Futé The cunning bison, the mascot of French traffic-jam-avoidance schemes. See travel page. Bizuthage: traditional initiation rites that used to be popular in French universities and some high schools. The practice of bizuthage began to die out from the 1970's onwards, as many of the rites were seen as being degrading, discriminatory, or even dangerous. Blanquette: literally "white stuff", the word is used both in cooking and in wine. Blanquette de veau is a veal stew - a stew made with white meat - but Blanquette de Limoux is reputedly France's original sparkling wine. It is said that the technique for making sparkling wine was brought to Champagne from Limoux, by monks in the sixteenth century. Bleu : the colour blue. The word can cause confusion for non-native speakers, as it is used figuratively to refer to several completely different things. a) Blue cheese (see Bleu d’Auvergne below), b) a bruise, and c) work overalls. Les Bleus is the nickname used to refer to the French national team in a number of sports, notably football. Un bleu, in printing, is a monochrome printer’s proof. Bleu d'Auvergne: Popular blue cheese. See cheeses. Bleu des Causses : Cheese - An appellation contrôlée cheese which is generally delicious and strong tasting, without being sharp. A cows-milk cheese, sometimes quite crumbly, manufactured in the same area as Roquefort and quite similar tasting. BNP - Banque National de Paris . One of the main high-street banks in France, now trading as BNP-Parisbas. BNP-Paribas is a CAC-40 company, and the largest bank in the Eurozone in terms of stock-market capitalisation, and in 2007 was the world's sixth-largest bank. As a high-street bank in France, it has some 2,200 outlets. Bo-bo 1) In French children's language, a bo-bo or a bobo is something that hurts, a bruise, cut or soemthing similar. Bo-bo 2) Bourgeois bohémien : a middle-class intellectual who professes left-wing views, but lives a lifestyle that largely contradicts this. The English equivalent might be a champagne socialist or an armchair socialist. Bonaparte, Napoléon Bonaparte, (1769-1821). Ruler of France from 1799 to 1815. Napoleon came to power as a successful military commander in the wake of the French Revolution of 1798, initially as First Consul, then as Emperor. A brilliant military and civil commander, Napoleon established good part of the basis of the modern French state, with its centralised power structure, law, and administration. Through military victories and alliances, he rapidly spread the power of post-revolutionary France across Europe. However, like Hitler in the twentieth century, he overstretched the capacities of his great army, when he tried to conquer Russia. The retreat from Moscow in 1812 was his first great defeat. It was followed however by his final undoing, defeat by the British army at the batle of Waterloo in 1815. Captured by the British, Napoleon was exiled first to Elba, from where he escaped, then to the mid atlantic island of Saint Helena, where he died in exile in 1821. Bordeaux (1) A major port city in southwest France, on the Gironde, and capital of the Nouvelle Aquitaine region. Bordeaux (2) : Wine, and wine growing region. With Burgundy and Champagne, the Bordeaux region is one of the three most famous wine-producing regions in France. Historically, its fame is at least in part due to the fact that of these three big wine-growing areas, the Bordeaux vineyard is the only one with immediate access to the sea, an advantage that has enabled it to be France's major wine exporting region for many centuries. In 1152, when queen Eleanor of Aquitaine married the English king Henry II, the Aquitaine region became economically integrated into the Anglo-Norman world, the Bordeaux region becoming a major supplier of wine for England. This historic wine exporting tradition helped Bordeaux to develop far stronger commercial links in the ensuing centuries, firmly establishing Bordeaux wines, often referred to generically in English as "clarets", on the international market. The Bordeaux vineyard is centered round the port city of Bordeaux , along the estuary of the Gironde, and the rivers Garonne and Dordogne. It is a large vineyard, and the geo-specific appellation "Bordeaux" covers an area stretching some 100 km both north-south and east-west. While the appellation contrôlée covers wines of medium quality from all over this region, many if not most of the top quality clarets grown in the overall area benefit from more specific and distinctive area appellations, such as Médoc , Graves or Saint Emilion, and even more local appellations such as Pauillac, Graves and Saint-Estèphe. Unlike other wine-growing areas, the Bordeaux area operates classifications of many of its top wines, notably those from the Médoc and Saint Emilion vineyards. The best estates in these areas have the right to sell wines designated as grand cru. Below the grand crus come other high quality wines designated as cru bourgeois. Boudin. A traditional type of sausage; there are two common varieties, boudin blanc and boudin noir. The former is made from ground pork meat and offal, and is a traditional and tasty starter for meals around Christmas. Boudin noir is blood sausage. Scots would call them "white pudding" and "black pudding", Scottish expressions where the word "pudding" is still used in its original sense, i.e. a type of sausage. Etymologically, the word boudin is the ancestor of "pudding". Bouilleur de cru. A dying breed, bouilleurs de cru are country-dwellers who still have the once-inherited right to produce about 20 litres of spirits per year, from fruit grown on their land, without paying excise duty. Transmission from father to son of the status of "bouilleur de cru" was stopped in 1959. However all other owners of land that is officially classified as an orchard or a vineyard have the right to produce, for their own use, about 20 litres of spirits, at a special discounted rate of excise duty, currently (2009) 7.5 € per litre of pure alcohol. In both cases, the specific allowance is 10 litres of pure alcohol; the actual volume of the liquors produced, typically in the form of Kirsch, Calvados, Mirabelle, or Marc, will depend on the alcohol content. Boulogne France's major fishing port, located on the north coast of France in the department of Pas de Calais. Also a port for cross-Channel ferries, though less used for this purpose than in the past. Boulogne, bois de.The largest green space in the centre of the Paris conurbation. Often referred to simply as "le bois", this old tract of woodland, situated just outside the city limits of central Paris (Paris intra muros), is the most famous of Parisian parks. Being situated on the western edge of the city centre, le Bois has traditionally been popular with the residents of Paris's more affluent and cultured western arrondissements, notably the 16th , and features prominently in many works of French literature. The park today covers an area of 846 hectares, three times the size of London's Hyde Park. Bourget, le. The original Paris airport, located just to the north of the capital, on the RER line between central Paris and CDG airport. Passenger services operated out of this airport from 1919 to 1980. Today, it is used only by executive jets and private planes. Le Bourget airport is home to the French Musée de l'Air et de l'Espace (Aerospace museum), and every other year (alternating with Farnborough, in the UK) hosts the Paris international air show. Bourgogne, 1) Part of the Bourgogne-Franche-Comté region in central eastern France, capital Dijon. The Burgundy area, formerly region, is made up of four departments, the Yonne, the Nièvre, the Côte d'Or and the Saône et Loire. It is bordered by Centre - Val-de-Loire, Champagne, Franche Comté, Rhone-Alpes and Auvergne. It is essentially agricultural, its most famous product being Burgundy wine. 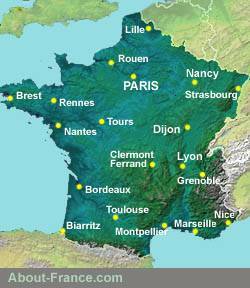 the northeast of the region includes the Morvan hills, the southwest covers the large flat expanse of the Saône valley. For further information see Burgundy region guide. Bourgogne, 2) the wine from the vineyards of Burgundy. The vineyards of the Burgundy region cover a narrow strip of land on the eastern slopes of the hills running south-east from the Burgundian Capital, Dijon. the heart of the Burgundy wine growing region is the small city of Beaune, where the autun wine sale in the historic "Hospices" building is one of the high points of the wine year. Burgundy wines are classified on four levels, the lowest being the generic "Bourgogne" appellation. Selected areas of the Burgundy vineyard have their own classifications, such as Côtes de Beaune. Within these, there are smaller areas, villages and groups of villages, reputed to produce higher quality wine, such as Pernand Vergelesse or Aloxe Corton. Finally, at the top of the pyramid, there are the estate wines, such as Clos Vougeot, with its mere 51 hectares of vineyard. Finding one’s way around Burgundy wines is sometimes a daunting task. The most famous brands are the reds, the best of which can keep for a good 20 to 30 years. However, Burgundy also produces some top quality, though not too distinctive, whites. Bourse, la. The Paris stock exchange, located in the Palais Brogniart in the 1st arrondissement of Paris. Bové, José. French MEP, elected to the European parliament on the list of the French greens in June 2009. Highly mediatized and self-styled leader of the Confédération Paysanne, an initially unofficial protest grouping of small farmers established as a backlash against the accelerating fall in the number and economic viability of France's small farms. Bové himself is a producer of Roquefort cheese, living on the barren Causses in southern central France. However his campaign in defence of the French small farmer developed into a more general anti-capitalist and anti-globalisation movement, with Bové being arrested twice and sentenced to prison firstly for leading a group of protestors in demolishing a partly built McDonald's restaurant in the town of Millau, and later for breaking into an agricultural research facility and uprooting thousands of genetically modified plants. When first sent to prison, Bové capitalised on the event by driving himself to the jail at the head of a procession of tractors, which received massive media coverage. To avoid a repeat of this, police arrested him a second time in 2003 with a spectacular dawn raid on his farmhouse, carrying Bové off to jail in a helicopter. While avoiding a second Bové media circus, the means employed in this arrest were seriously criticised throughout the media. Since the mid 1990's, Bové has also been present at most major international economic and social forums - including Puerto Alegre and Seattle - leading to accusations that he is not really the typical small farmer he claims to be. Brassens, Georges 1921 - 1981. Probably the greatest traditional French singer (chansonnier) of the mid twentieth century. Brassens, who came from a working-class background, sang notably of Paris life, the high and the low, his songs being poems, sung to a distinctive but simple guitar acompaniment. Bresse Flat area to the north of Lyon, characterised by a large number of lakes (les dombes) . The area is famed for its birdlife, and for its frogs. Brest. Biggest town of the Finistere department, on the Atlantic coast of Brittany, Brest is a major French naval base and France's most westerly city. The port is home to France's Atlantic fleet, and principal naval academy. Bretagne. the Brittany region of France, situated in the north west of the country. Capital city Rennes. Brittany is bordered in the east by Normandy, and in the southeast by the Pays de la Loire. It consists of four departments, Côtes d'Armor in the north, Finistère in the west, Morbihan in the south, and Ille et Vilaine in the east. Its main activities are agriculture (vegetables, dairy products) and tourism. Historically, the Brittany province of France was larger than today's Brittany region, and also included land down to the river Loire, including the city of Nantes, which was once the capital, but now no longer in the region. For more information click for guide to Brittany . Brevet: a) a patent. b) the nearest French equivalent to GCSE exams, an exam taken by pupils at the end of middle school (collège). Further details see article secondary education in France . Brie a) Cheese. There are two sorts of Brie, Brie de Meaux and Brie de Melun, both appellation contrôlée cheeses named after two nearby towns in the the country some fifty miles south east of Paris. Brie comes as a thin round cheese about 20 inches in diameter, with a soft white crust. This crust is eaten, not cut off. Brie is a very mild creamy cheese that should appeal to anyone who does not enjoy strong tasting cheese..
Brocante : jumble sale, second-hand sales. Unlike vide-greniers, which are essentially for private individuals, brocantes are generally reserved for professionals, such as antique dealers or junk-shops. The biggest brocante in France, with some 10,000 sellers, takes place each year during the first weekend in September, in Lille. This traditional event is open to professionals and individual sellers. Brogniart, Palais The building in central Paris which is home to the Paris stock exchange, known as La Bourse. The building owes its name to the architect who designed it. Bulletin Officiel: An official government publication. The best-known of the various Bulletins Officiels, often just referred to as the BO, is the Bulletin of the Ministry of Education (B.O.E.N.). Bulletins officiels publish official information and instructions, regarding the workings of areas of the public sector, the application of decrees and laws within the sector concerned, lists of vacancies and high-level appointments.